Earlier on the website I covered three flour mills which emerged in HK in the 1950s and 1960s – namely Hong Kong, Kowloon and HK Food Products. The last one to cover is Far East Flour Mills, which was opened in July 1967 by the entertainment and banking tycoon Deacon Chiu (邱德根 1924-2015) in Tsuen Wan and operated in HK until 1981 when it relocated to Shekou in the mainland. Although the flour mill was probably one of his biggest investments in terms of capital, the business was seldom covered as the press were drawn to the more “glamorous” ventures of Chiu such as his ownership of Asia Television in the 1980s or the Lai Chi Kok Amusement Park and even his half-completed memoir My Life dedicated close to nothing on the business. Started his career as a cinema conductor in old Shanghai, Deacon Chiu built a chain of movie theaters in the New Territories in the 1950s and by the early 1960s his Far East organization included a dozen theaters, the Lai Chi Kok Amusement Park (acquired in 1962), Far East Bank, hotels and lots of properties in Tsuen Wan, which was his main base of operations. Outside of business, he was active in the community affairs of Tsuen Wan having served as chairman of the Tsuen Wan Chamber of Commerce, help established the Yan Chai Hospital and was even invited to become a member of the Heung Yee Kuk. The planning for Far East Flour Mills began as early as 1961 as the firm was incorporated that year with registered capital of HK$6 million. Between 1955 and 1967, the annual demand for flour among Asian countries increased by 40% and the success of the Sung family’s HK Flour Mills attracted interest from others to enter the business. Tsuen Wan, with its strategic location, was also transforming from a village to an industrial area with textile mills and enamelware factories moving in which probably inspired Deacon Chiu to move from service industries into manufacturing. Chiu suffered a number of setbacks in the mid-1960s as his wife and mother of his five young children Ju Ching-chu (裘錦秋) died in a plane crash in Taiwan in 1964 together with his business partner Loke Wan-tho of the Cathay Organization, William Hu of Wader Studios (see article) and 54 others and his Far East Bank came under tremendous pressure during the banking crisis of 1965, which ultimately resulted in him losing majority control in 1969. Nevertheless, despite these setbacks and the riots of 1966 and 1967, he pressed ahead with the flour mill project and the Far East Flour Millon Yeung Uk Road in Tsuen Wan waterfront finally opened on July 1967 in a ceremony attended by the top colonial officials and elites after 6 years of planning and total investments of over HK$10 million. Occupying a plot of 40000 sq ft, the mill was seven-story tall and had 130,000 sq ft of factory space with the latest equipment, 14 wheat storage units that could store over 6000 tons of wheat each and daily production capacity of 5000 bags. The finished products were stored in nearby Far East godown. In its early years, Far East Flour Mills had four main brands – “Beautiful Girl” (美女牌) using Canadian wheat which sold for $17.50 a bag; “Three Goats” which used American wheat and was good for making mooncakes for $14.80 a bag; “Red Leaf” which was made out of Canadian wheat and was good for making wontons and noodles for $16.90 per bag and “Shun Fung” made out of American wheat which was good for cakes and biscuits at $13.30 a bag. 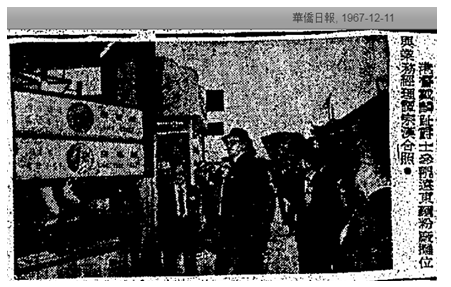 To promote its flour and compete against the three major competitors for the 280,000 bags of flour consumed locally at the time, Far East established a retail store at 240 Lai Chi Kok Road in Sham Shui Po which opened in October 1967 as shown below. 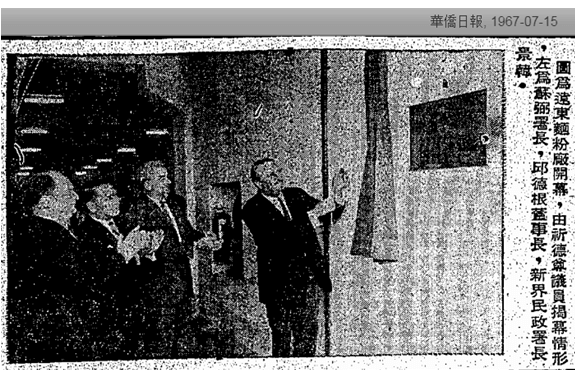 It also participated in the HK Products Expo that year and the Governor visited its booth. One of the early wins for Far East was landing the contract to supply The Garden Co, the famous maker of Life Bread and other baked goods and biscuits in late 1967, which had just moved into its new 80000 sq ft facility in Sham Tseng. Little info is available about the development of the Far East Flour Mills in the 1970s other than the fact that Far East Flour Mills Ltd became Far East Real Estate & Agency Ltd in 1973 and Far East Flour Mills (HK) Ltd was incorporated in 1976 as holding company for the mill. By 1980, reclamation in the Tsuen Wan waterfront had made it difficult for the firm to operate out of the area and in fact a 600 feet tube need to be added to the mill for transportation of wheat from ships in the waterfrontthat came in from the US and Canada. In April 1980, Far East Flour Mills announced the formation of Far East China Flour Mills Ltd (遠東中國麪粉廠) in partnership with the state-owned China Merchants to build a new plant in the Shekou (蛇口) industrial zone in the mainland border and plans to wind down the Tsuen Wan mill. The total investments of theShekou project exceeded HK$100 million and the new plant occupied 50,000 sq ft with projected annual production of 3 million bags by the completion of phase I, 4.5 million bags by phase II and 7.5 million bags by phase III (with half of the bags weighing 50 pounds and the other half weighing 100 pounds). 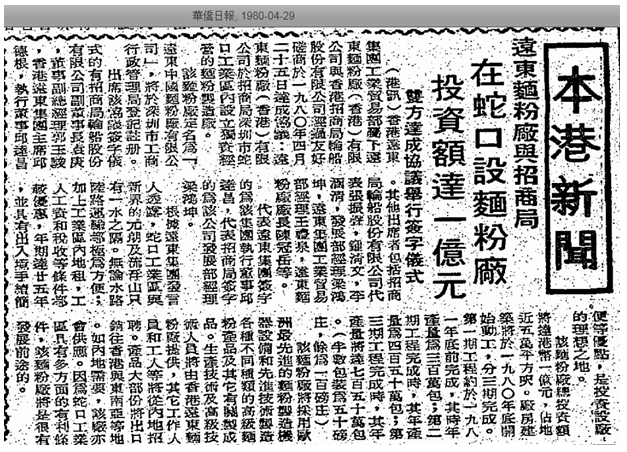 According to Ringo Wong Lai-chuen (王禮泉), who was manager of the mills at the time (also looked after Bang Bang for Deacon Chiu and became assistant to Nina Wang of Chinachem), the decision to move production to Shekou was prompted by the lack of support from the HK government in the development of the flour and food industry and also the urban development in Tsuen Wan which was making it unfavorable to continue its operations there. The Shekou plant went into production in the first half of 1982. In May 1981, Far East Flour Mills formed another joint venture in Shekou – Far East Biscuit Factory China Ltd – in partnership with Khong Guan (康元), the leading biscuit manufacturer in Singapore controlled by the Chew family with HK$10 million contributed equally by each party. The plant which sat on 10200 square meters of land began with initial output of 11 million kilo per year and 500 workers, with technicians and equipment sent in from Singapore. In addition to flour and biscuits, the Far East group also established an animal feed mill in Shekou in partnership with Gold Coin from Singapore.In 1985, United Industrial Corporation of Singapore acquired 50% of Far East Flour Mills for the nominal sum of HK$1 and assuming HK$20 million of debt but the Far East group later bought back the stake. In 1990, Dachan Food (大成食品) of Taiwan controlled by the Han family acquired Far East Flour Mills from Deacon Chiu and the mill in Shekou became known as Dachan Flour Mill (大成麵粉廠) with its “Dachan” brand of flour for exports and “Iron Man” brand for distribution in HK and the Pearl River Delta. The plant was finally shut down in 2010 although the Dachan group remains a leading player in the food industry in the Greater China region while the Far East group had shifted its focus to hotels and properties in the past two decades under the leadership of Deacon’s son David Chiu. This article was first posted on 31st December 2018.